Sea cages form aggregation sites for wild fish of many different species. These have potential to benefit the fish by providing protected nursery grounds and additional sources of food, or they may act as ecological traps that divert fish from the breeding population, expose them to new sources of mortality or fragment the population. MASTS funded PhD student Joly Ghanawi has been sampling wild fish (mostly whiting and mackerel) at farms, and surrounding non-farmed waters on the West Coast of Scotland. Stomach content and fatty acid analysis show the different species make different uses of the farms throughout their lives and population modelling work is ongoing to extrapolate this to likely effects on the overall populations of the species of interest. The fieldwork is supported by a small project grant from the Fisheries Society of the British Isles. As well as providing food for direct human consumption, a certain proportion of fish capture has been directed to other uses. 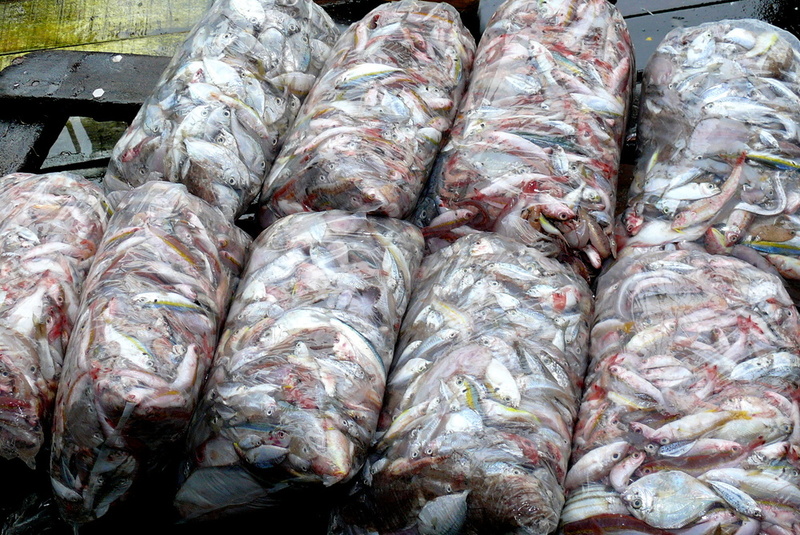 These have often been termed “reduction fisheries” and over centuries, fish has been “reduced” to provided oil for industrial uses such as for lamps and for machine lubrication and for meals for animal feeds (particularly poultry, pigs and pets), until the early 1970s when reduction fisheries reached their peak. Around that time, the rise in aquaculture started to take an increasingly large proportion of the global reduction fishery supply and now accounts for over two thirds of fishmeal and around four fifths of fish oil available. Reduction fisheries have been in the spotlight, like many other fisheries, as concern mounts over their sustainability and higher regulation and quotas have meant that the landings have not exceeded the 1970s peak but fluctuate due to El Niño events and natural variations in stocks. As aquaculture has grown, the sustainable supply of fishmeal has not been able to keep pace, so that the inclusion in aquaculture diets has fallen by half in ten years. However, fishmeal and oil is important for cultured fish health, particularly in the early stages and therefore a steady supply is important to maintain. Fishmeal is increasingly being sourced from the by-products of fisheries and aquaculture. This helps to reduce waste from fish processors and supply the increasing demand in the aquaculture industry. Dr. Richard Newton has been engaging with the Marine Ingredients Organisation (IFFO) to help identify further supplies of fishery and aquaculture by-products which may help to supply the aquaculture industry with the marine ingredients that it needs to provide a healthy and sustainable product. Research has shown that significan opportunities exist in Asia where fish could be more highly processed. There are also opportunities to use by-catch from highly regulated European fisheries which has to date been discarded. In Asia high amounts of unregulated by-catch (trash fish) are still regarded as an important sustainability issue which needs to be addressed.